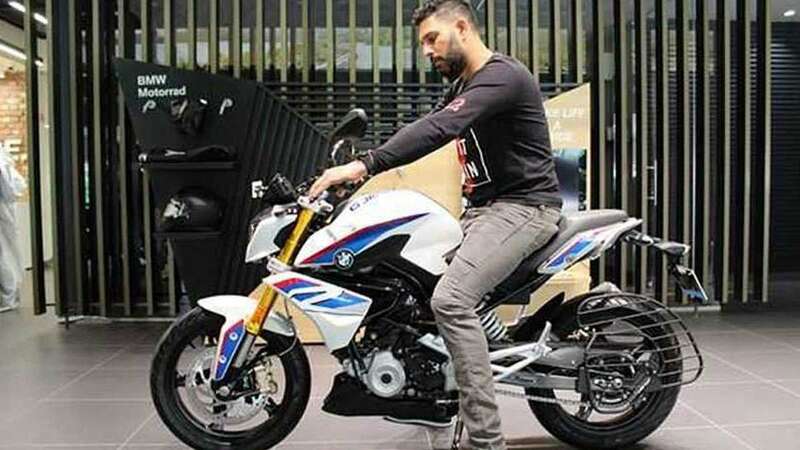 New Delhi : Indian cricketer Yuvraj Singh took delivery of his brand new roadster – BMW G310R. He is better known for making a collection of luxury and sports cars in his garage. This is one of the rare times when he had gone to buy a two-wheeler. Among the other motorcycles collection he owns a Hero CBZ Xtreme which he had won for one cricket match. Besides this, he's also had a customised KTM to his name - modified KTM 390 Duke. The Yuvraj Special X-12 was unveiled during India Bike Week 2015. YouWecan KTM kits were also launched that year at a price of Rs 49,390. A couple of weeks back BMW G310R was launched during a stunt show. It is one of the most affordable and smallest motorcycles by the BMW brand. It is manufactured in India at TVS Motor Company's Hosur facility. BMW Motorrad's entry-level street naked is powered by a 313cc single-cylinder, liquid-cooled engine that produces 34 bhp and 28 Nm of peak torque, and is paired with a six-speed transmission. The same engine also comes mounted on the TVS Apache RR 310 and has been jointly developed by TVS Motor Company and BMW Motorrad.